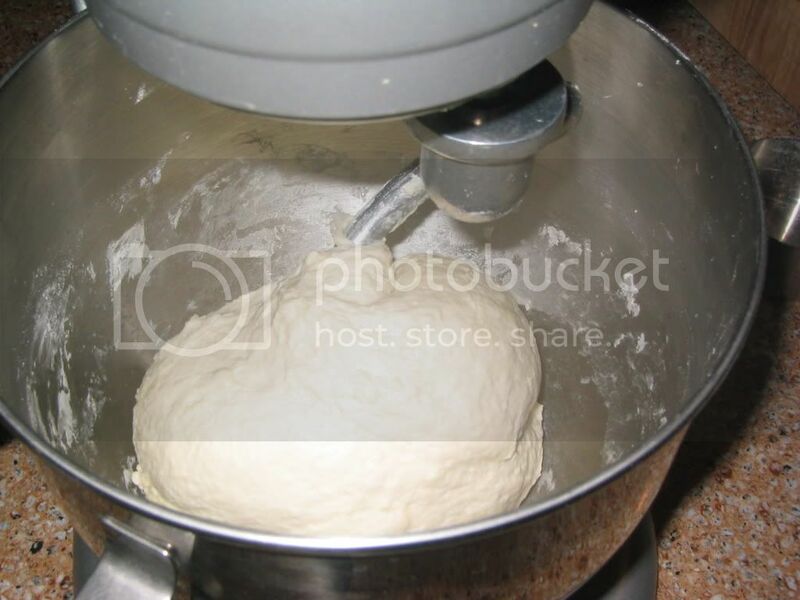 1) Make your own dough and post the recipe. Thin crust. Whole wheat. 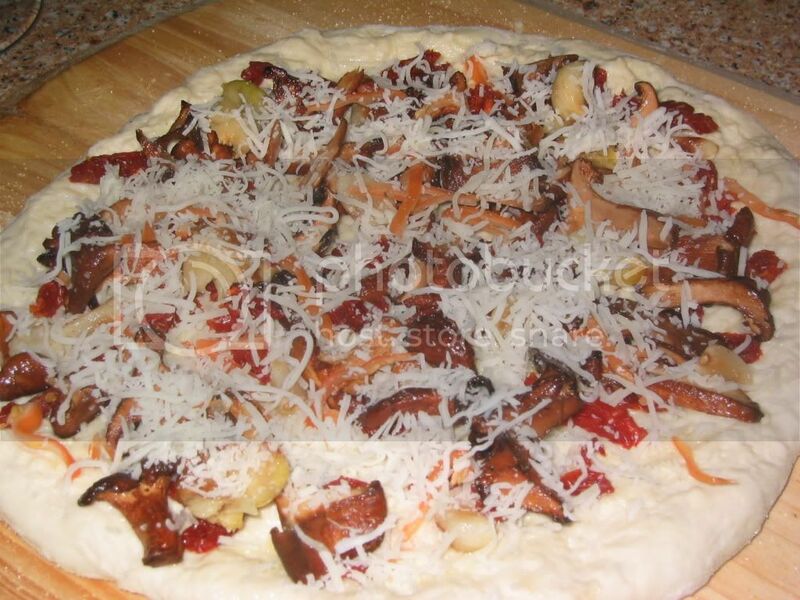 Foccacia. NY or Chicago style. Naan....your choice! 2) Make your own sauce and post the recipe. Red. White. Olive oil w/ garlic. Whatever gets your mojo workin'! be ridiculed with extreme prejudice and boooooed heavily! 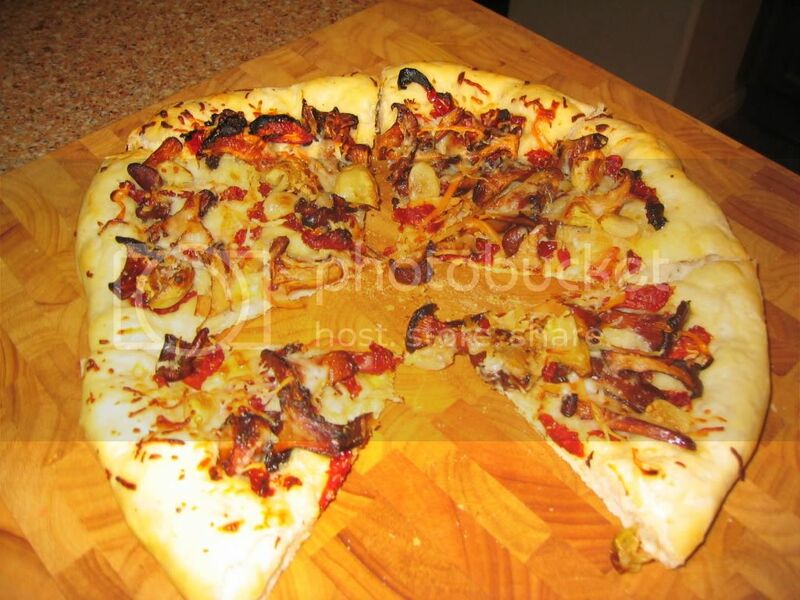 4) Toppings can be anything. Pepperoni. Avocado. Greek olives. Pulled pork. If it came out of the ground or walked, swam or crawled, its all cool and the gang! 5) Bake them in the oven on a sheet pan. In cast iron. A pizza stone. On the grill. 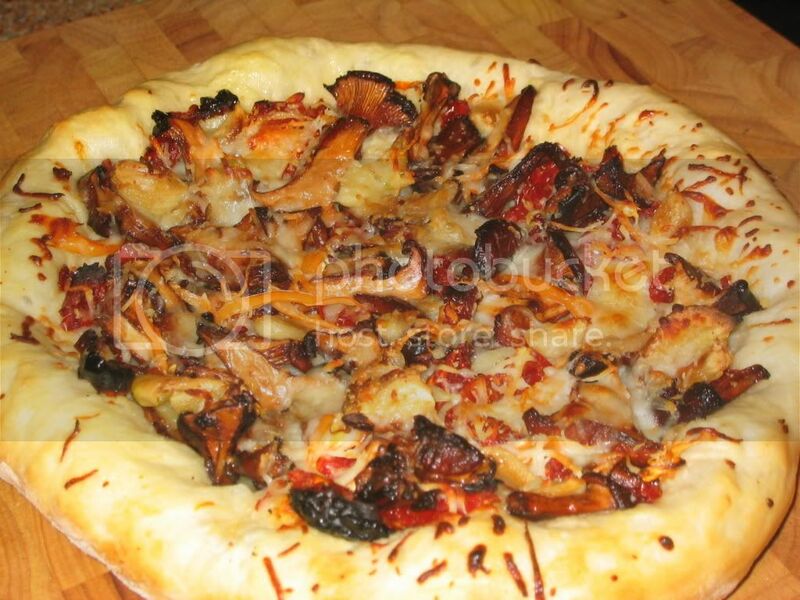 Got a wood fired pizza oven? Have mercy! 6) Pics are mandatory! Anyone can talk smack about it but put up or shut up. No pics? It never happened and ridiculing and boooooing will follow. Capiche? Last eve I got my dough going. Now generally in any baking it is recommend to measure by weight but I have found that with pizza, more often I find myself measuring by volume and winging it. This dough is simple. 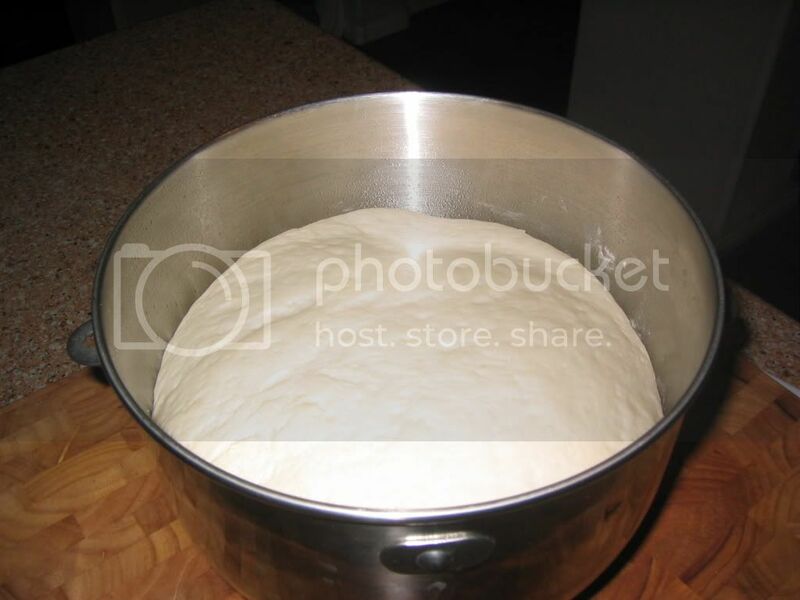 When doing this dough, I like to rest it in the fridge for at least a day before using. It's chilling and getting happy now for use later today. 1 1/2 c of H2O warmed to 110f. 2 tsp of active dry yeast. Whir and stir well and wait for it to bloom. 3 3/4 cups of MorBread flour. 2 Tbs of olive oil. 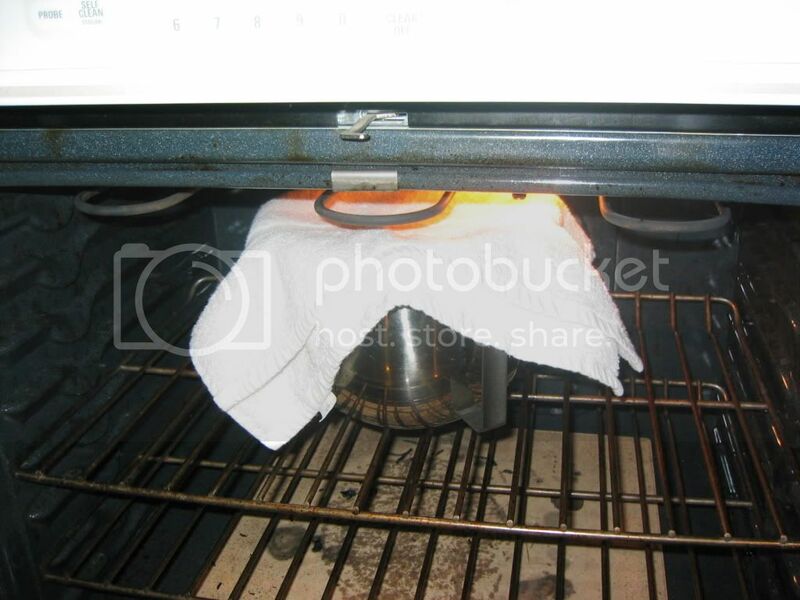 It may be necessary to add more oil, flour or water depending how loose you want the dough. When the dough starts to smooth out, I then remove it and cover with a cotton towel and put it in a warm place to proof. 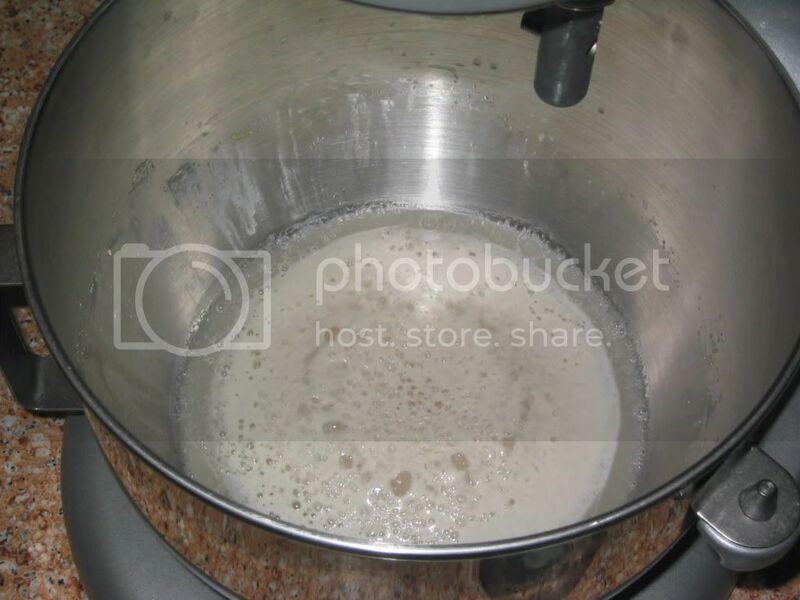 The yeast and water bloom. If The Blues Kitchen is on the cool side, I warm the oven to about 160f and place the dough in there covered with the door open to proof. Here's the loveliness more than doubled up. From here, I punched it down and portioned into 3 parts where it then went into ziplocks sprayed with PAM and then into the fridge to rest. Later on today I'll crank up the pizza stone. 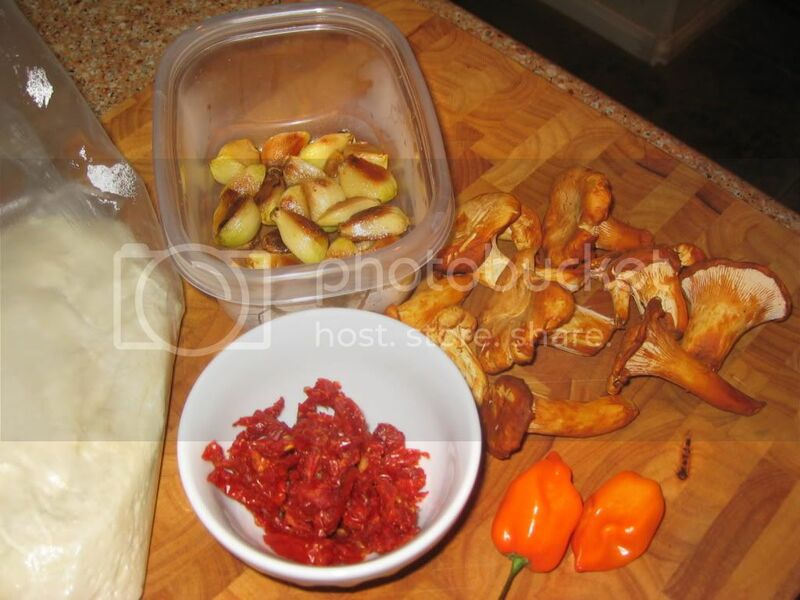 Definitely on the ingredient list for today will be fresh chantrelle's, roasted garlic, sun dried toms and habs. Who knows what else? Stay tuned to this same bat channel to find out ya'll! Perfect Day for this thread TB, I am making pizza later this afternoon to munch on during some football action, however I made my dough yesterday so I dont have pics of that process but I will take some of the raw dough when I roll it out later. heres my recipes for the Dough and Sauce.. pics coming later when I start making it. 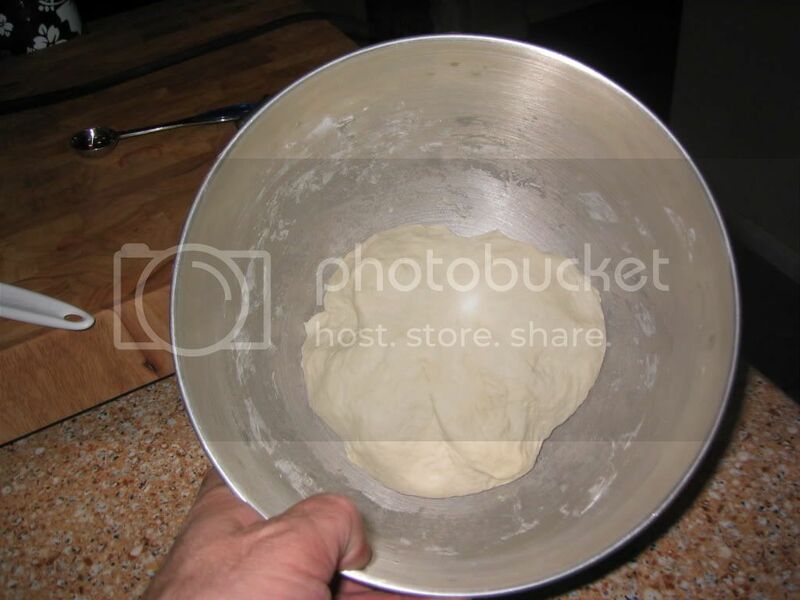 Place the dough into a greased bowl and cover with a clean towel. Place in a warm, draft free place for about 1 hour, or until it approximatley doubles in size. 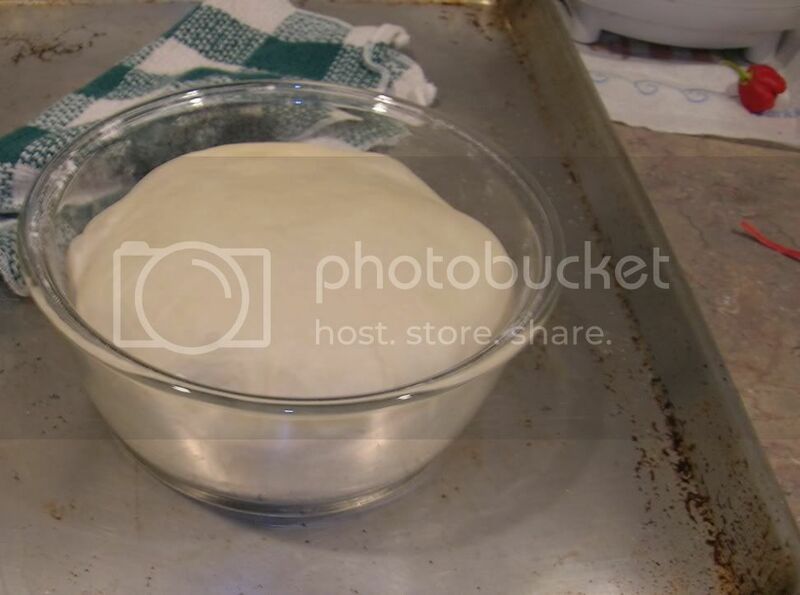 at this point you can roll it out and get your pizza goin' but like TB I also like to chill my dough in the fridge for atleast several hours or overnight. then squeeze the tomatos in a bowl catching all the juice. Chop the onions, garlic and pepper really well, and start them frying in plenty of oil in a large pan. While they're cooking, throw the tomatos into a blender and mostly puree, not completely, leave some chunks. When the onions are starting to brown, or they're clear, probably about 5-10 minutes, start putting in the tomatos and stir well. Let it simmer for a while, and put in whatever seasonings you like, in whatever amounts. I like plenty. I also put in a couple teaspoons of sugar. I modify this recipe fairly often but this is the basics you can freeze whatever is leftover after you make your pizza then just thaw it out next time you need it. Edited by WickedMojo, 10 October 2010 - 04:35 PM. Lookin' forward to the coming mojo WM! Pizza could just be the perfect food. Great new thread TB, you got that pro mixer goin there. Can't wait to see the outcomes from both of you. I'm goin in a different direction today, Chile Verde. Will be posting pics later on DC. You're right TB could be the perfect food and universally adaptable. Too much work for me. Pizza Hut or Papa John's will do. Count me out. I don't make my own dough....Martha White mix is about as close I get....and it does just fine. Pizza looks cheezy weezy WM. Watcha' got for teh heat on there? Not a very epic pizza but it was what I planning to make today anyway , so it was cool to find this thread posted this morning. Edited by WickedMojo, 10 October 2010 - 04:42 PM. This all hit me by surprise. Coincidentally I'm making pizza right now, but I am ashamed to admit I am violating several of the rules. I'm using raw pizza dough from a local bakery and pre-made sauce. adding secret ingredients to be revealed when I get all up in this thread. No heat tonight. This one is for the wife and kids. TB, cant wait to see the rest! 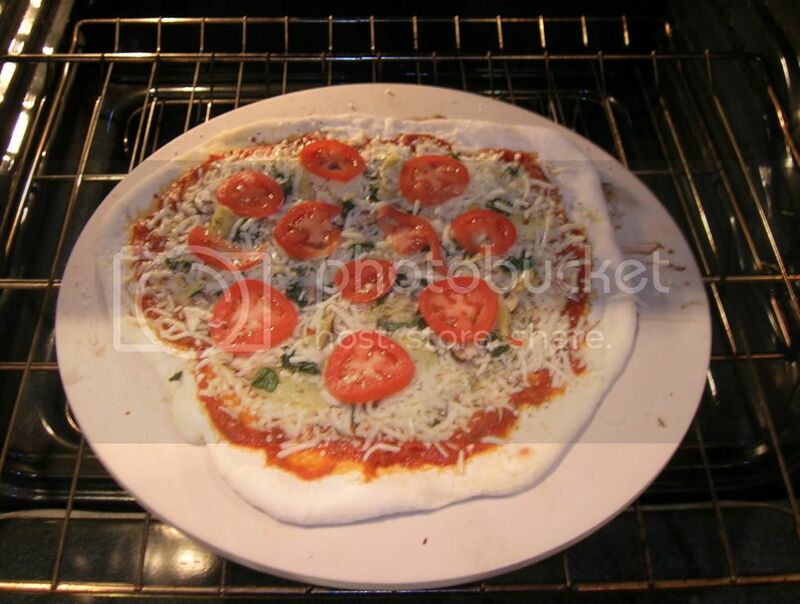 Pizza is a staple around here, and homemade dough and sauce are usually included. Just not tonight. Thanks TB for getting this ball rolling! Banana leaves and foo foo are welcome. Odd....why do I think of you making a pizza with rum sauce? So that's it. 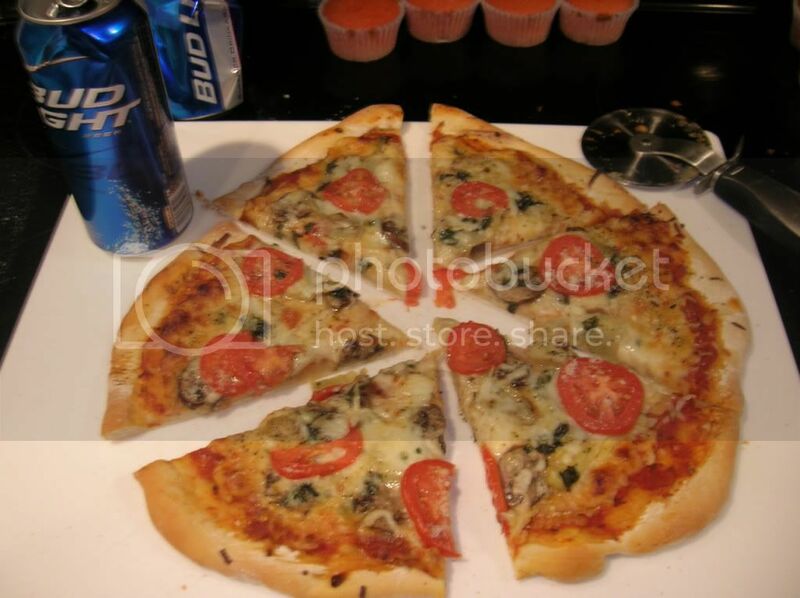 Take out pizza is good in a pinch or after many brewhaha's but nothing and I mean NOTHING beats making your own. You don't have to be any super wombat cook or chef to do it, it's as easy as it gets. And it can be healthy too!! So ya'll come on and get down brown and get your mojo workin' on your own brand of pizzafication! That pizza looks very tasty TB. 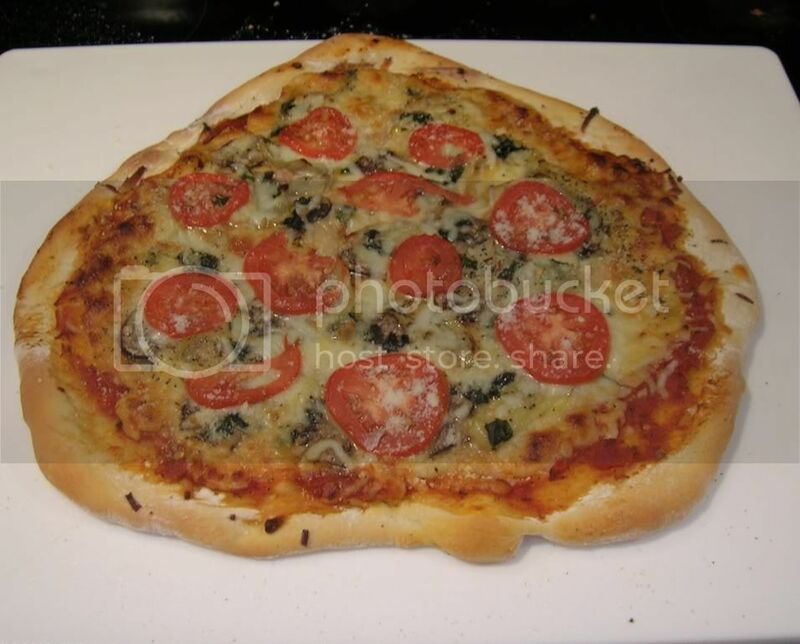 I use to buy some Borboleta pizza dough and put my own stuff on it, that was pretty tasty. Great pizza TB! that looks down right delicious! Those look like some tasty pie, never tried making homemade. Guess maybe I'll have to give that a try one of these days.